This lavishly illustrated atlas demonstrates normal in-vivo anatomy of the cornea, limbus, and conjunctiva; quantifies various cellular structures using cell-density calculations; and establishes correlations between novel optical sections of various diseases of the ocular surface and clinical findings. It also describes early signs of different eye diseases and supports the reader in diagnostic and therapeutic management. 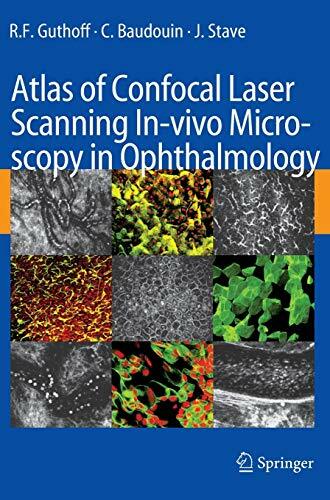 Confocal microscopy with laser scanning technology yields in-vivo images of ocular and ocular adnexal surfaces that are so brilliant that they rival histology in terms of quality. This unique atlas and textbook demonstrates normal in-vivo anatomy of the cornea, limbus and conjunctiva, quantifies various cellular structures using cell-density calculations and establishes correlations between novel optical sections of various diseases of the ocular surface and clinical findings. Furthermore, it supports the interpretation of novel high-magnification optical sections by comparing corneal and conjunctival imprint cytology with in-vivo images and describes early inflammatory changes in corneal grafts, as well as corneal conjunctivalisation in limbal stem cell deficiency, corneal dystrophies or infections, flap interface and margin characteristics after laser in-situ keratomileusis (LASIK). In addition, it instructs the reader about diagnostic and therapeutic follow-up strategies and provides a brief introduction to applications in other fields such as dentistry and ear, nose and throat surgery. 2. 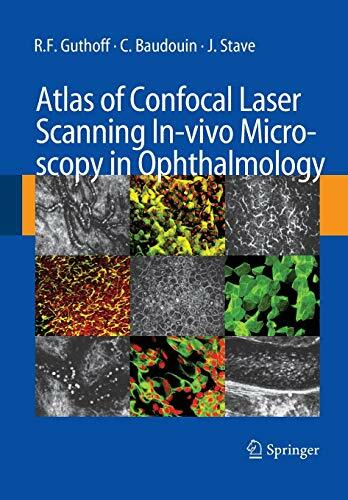 Atlas of Confocal Laser Scanning In-vivo Microscopy in Ophthalmology [Hardcover] Guthoff, R.F. ; Baudouin, C. and Stave, J.
Guthoff, R.F. ; Baudouin, C.; Stave, J.